and do the things I never do. They jog. They hike. They climb. that’s flung across the table where I don’t remember putting it. I bet they’ve been out dancing—two-stepping and high-footing it. When my cowboy boots go riding, I’d like to go along. I’m pretty sure, however, they think things would go wrong. Perhaps the horse would throw me or I’d wind up getting lost. I’m sorry that I bought them, considering the cost! but when my shoes and I face off, I am the one to lose. I could take to going barefoot. This would work while at the beach. trapping sand between my toes everywhere I’ve been. that I’ve left them out as well by venturing out shoeless! We were asked to write about an ordinary objects For dVerse Poet’s Pub. This entry was posted in Clothes, humorous poem, Uncategorized and tagged dverse poets pub, poem, poem about shoes, silly rhyme on December 11, 2018 by lifelessons. I spy SANDALS. I LOVE sandals. Ugly sandals, graceful sandals. And chunky boots. You wear the same shoes — and in the same styles — I do. I knew we were sisters. It’s all in the feet! I can’t stand to have anything pressing on my toes!!! I really like your poetic take on this prompt. You are ready for the next blockbuster hit “Shoe Story!” You never really know what goes on in that closet when the doors are shut!! Uh oh. You must realize I am very suggestible when it comes to ideas for poems. Good idea. Your blog or mine? Of course. Plus a share of the profits. I will hold my breath! I am the same way! I have often found a spin off for a poem as I read the responses. Sometimes I get them from my own responses to others! I know.. I’ve done the same. Almost everything I report in chats to forgottenman during the day ends up in his insisting I blog it. I would do nothing but blog if I followed all his suggestions. I know what you mean! We do have a life as well!! I love this, Judy — wonderful imagery of the shoes playing while you’re out! I wear sandals most of the time, or simple flat shoes when it’s cold. My prehensile toes love the sandals most of all! Mine, too. 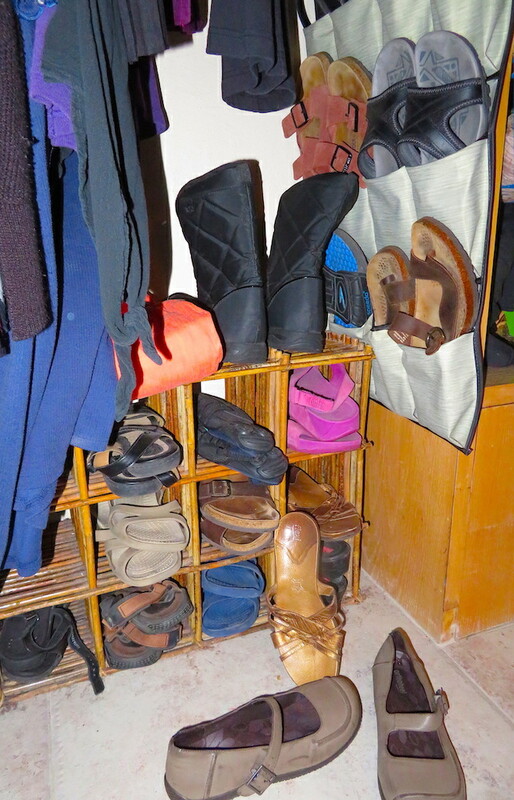 My closet doesn’t quite reflect all the possibilities for shoes. Comfort first these days. I’ve long since given up wearing shoes with more than 1/2″ heels! Flat shoes all around for me, too. Thanks, Dolly..Do you know you are one of my top 5 responders via comments? You are a busy lady as I know you have lots of followers and lots of blogs to read so never think I take you for granted. Every comment is much appreciated. Thank you, Judy, and you are one of my top favorite bloggers to read and enjoy every day. I just let it happen. Try not to get out of the way of the words! the story of the shoes intrigues and fascinates me. thank you for participating in this prompt and bringing so much fun with your poem. that the shoes are left clueless and probably wondering what you would do next gave me a fit of giggles! One question? Do they talk among themselves at night when they think you are asleep and oblivious?! such a good take on the prompt, such a delight for me! Shoes! We girls and our shoes! Thanks, Gina. I don’t know if they talk. Most of them are tongueless but all have good soles. You can barely blame them for wanting to have a little fun on their own and it’s nice not to have them under foot all the time. And your answers tell me so much about your lovely heart. yes and no tongue wagging among them, good sloes indeed! i bet them just love the freedom you give them! Okay, okay. I give in. A kids book about what goes on in the closet after the lights go out is upcoming. Perhaps during my two months at the beach. I already have one on socks and one on fish feet and one on knees. Can “Out of the Closet” be far behind? Closed secret happenings! wonderful! and writing by the beach sounds so very inspirational. a good follow up book, transporting to a magical hidden world right before our eyes! Let’s see if it makes the top of the writing list. This was so much fun to read! Love the rhyming and the whimsical feel to the poem. I also like the idea that our clothes and shoes are out having adventures when we’re not having them. Thanks, Jade. Who knew that so many bloggers would be into shoes–other than the buying and wearing of them? I appreciate your commenting. Love the tone and the way you seem to be held captive by your shoes… good thing to escape them at the beach every now and then. Exactly my thoughts about the matter. As one gets older, bones protrude and it is harder to walk barefoot. Sand is the solution. Spiraling Ballet And Martial Arts Free Style..
A Search For New Magic Shoes next..
the Wizard of Oz too..
Good for you, Katie! More energy by far than I have. i’m in the same situation. So much to do but none of it has to be in the pursuit of money. Lucky us. Nice last two lines with the clueless and shoeless rhymes. Thanks, Frank. Gone all day. Just now getting around to my poem for the day.